Why Eat a Plain Burger? Autumn will be here in a couple of days and I waged a small culinary protest to the end of summer by heading out to grill a batch of burgers. Not that weather ever stops me from grilling. I go out in boots and raincoats as needed; it’s just so much more pleasant when the air is warm, as it was when I made this recipe using a quintessential summer ingredient, barbecue sauce. Why eat a plain burger when you can have fun doctoring up lean ground turkey? This recipe adds green onion and sun-dried tomato along with the sauce for a zesty finish. It begs for a slice of sharp cheddar on top. Turkey Tip: With the exception of ground meat, I don’t freeze uncooked meat as the quality suffers. I keep a couple of 1-pound cylinders of frozen Diestel ground turkey in the freezer for burger and meatball cravings. 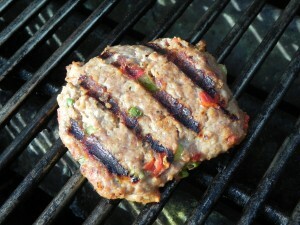 For burgers, I use turkey with 5 grams of fat per 4-ounce serving, lean but not too lean. Ground turkey breast produces a dry burger unless you add a fair amount of additional fat to the mix. Cheese Tip: If you’re looking to trim saturated fat from you diet and must have cheese on your burger, try reduced-fat cheddar. We always keep a block of Kerrygold Reduced Fat Aged Cheddar or Trader Joe’s Reduce-Fat Sharp Celtic Cheddar on hand for sandwiches, snacks, omelets and even pizzas. In large bowl, combine turkey with remaining ingredients; blend well. Form into 4 patties. Grill, broil or pan-fry as desired, turning once, until cooked through. Makes 4 servings. *Remove crust from 1 slice of bread and whirl in food processor.